What sets Play & Park Structures apart from other companies is the ability to deliver a boutique experience with the backing of the largest playground manufacturer in the world. Focusing on fact-based research coupled with observing and studying how children play informs every aspect of our component and product design, helping to create the ultimate play experience that keeps kids and parents coming back time and time, and time again. Play & Park Structures knows that playgrounds are an integral part of childhood development. We strive to provide high quality products that inspire children’s imaginations and creativity through innovation and superior product design. Our design team continually advances the concept of play through unique designs, including traditional post and platform playgrounds, deckless, continuous-play structures, as well as nature inspired playgrounds. We have an appropriate play solution for a full spectrum of needs and aesthetics, including parks, schools, early childhood centers, churches, and community centers. Whether your project calls for a traditional playground or creatively themed play, the variety of styles and materials offered allows you to choose the perfect playground to complement your vision. Play & Park Structures created the first Outdoor Creative Play & Learning System that brings standards-based activities to the playground and outdoor environments to support children’s physical and mental development. With over 400,000 square foot in manufacturing and distribution, our facility is equipped to handle orders of large or small quantities with a typical lead time of 24 to 45 days. Play & Park Structures™ was established with the mission of designing and manufacturing the highest quality playground products at the most competitive prices. Since that time, many milestones have been reached. We created a-Maze™, a revolutionary, moveable panel that could be integrated into playgrounds with a variety of configurations. Amaze inserts help develop cognitive, social, fine and gross motor skills, while inspiring creativity and fun! We became the first playground manufacturer to supply standards-based curriculum kits for specific playground components. We created the Outdoor Creative Play & Learning System™ which takes standards-based lessons outdoors. We also introduced our Music Makers line bringing instruments outdoors to the playground. We introduced an entire new line of playground structures called Horizons™. Horizons provides a new outdoor experience for children to get outside and be active. It’s unique, deckless system offers continuous play creating imaginative fun for all! We introduced Skyline, an architectural play system with an urban look. Open sight lines and lots of overhead, motion and climbing events make it the perfect structure for older kids who like to be challenged. We also added a variety of nature-inspired items, to aide those customers who wanted a themed, natural play scape. Play & Park Structures launched Boulderscapes, a unique climbing system utilizing cable and rotationally molded rocks to challenge even the most experienced climber. In an effort to elevate our commitment to providing inclusive play environments for people of all abilities, we launched our PlayAbilities product line designed to celebrate ThisAbility with unique ground level, interactive climbers, sensory events, tactile seating, and playground compliant music elements. We have dedicated our fully staffed Product Development team to continually develop new and improved products by using state-of-the art technologies. Our mission is centered on an offering of products, programs and services to provide you with the tools you need to be a hero in your community. Our promises to you are simple: enhance classroom learning, create environmental awareness, promote physical activity, play for all abilities, and building community. Play & Park Structures believes in sustainability and is committed to taking the necessary steps to ensure our children have a safer environment for play. 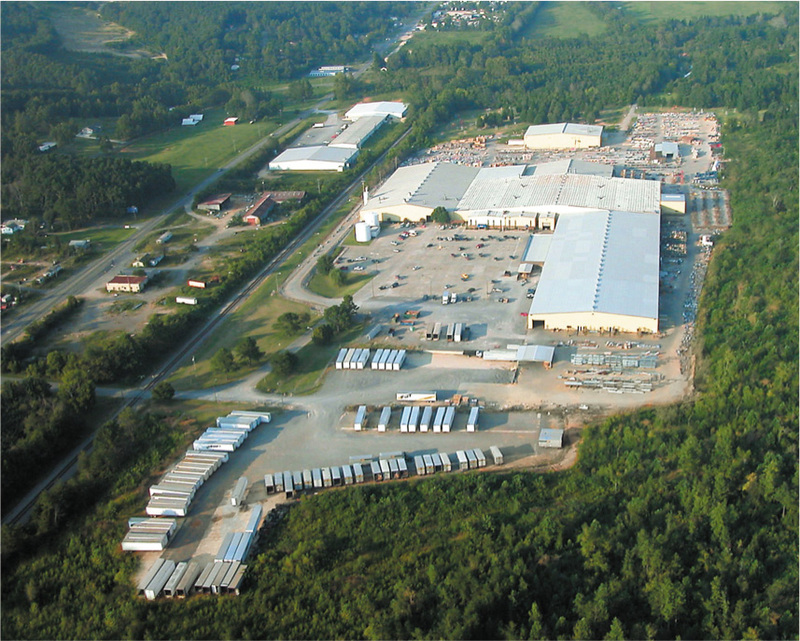 We are proud to be ISO14001 certified for our manufacturing facility in Fort Payne, Alabama. Also referred to as the “Green Certification,” ISO14001 is an internationally recognized standard for environmental management, measurement, evaluation and auditing. As an ISO14001 certified company, Play & Park Structures controls the environmental impact of our activities, products, and services by implementing an Environmental Management System (EMS) that meets international standards, but is specific to the play products being produced. PCI 4000 Certification, is an extensive audit program that evaluates business practices, process elements, equipment, capabilities, employee competencies and quality control capabilities of a coater to ensure they are capable of producing a high quality powder coated product with a high degree of customer satisfaction. The PlayCore Southern Fulfillment Center, where Play & Park Structures playgrounds are manufactured, is the only playground manufacturer with this elite certification. 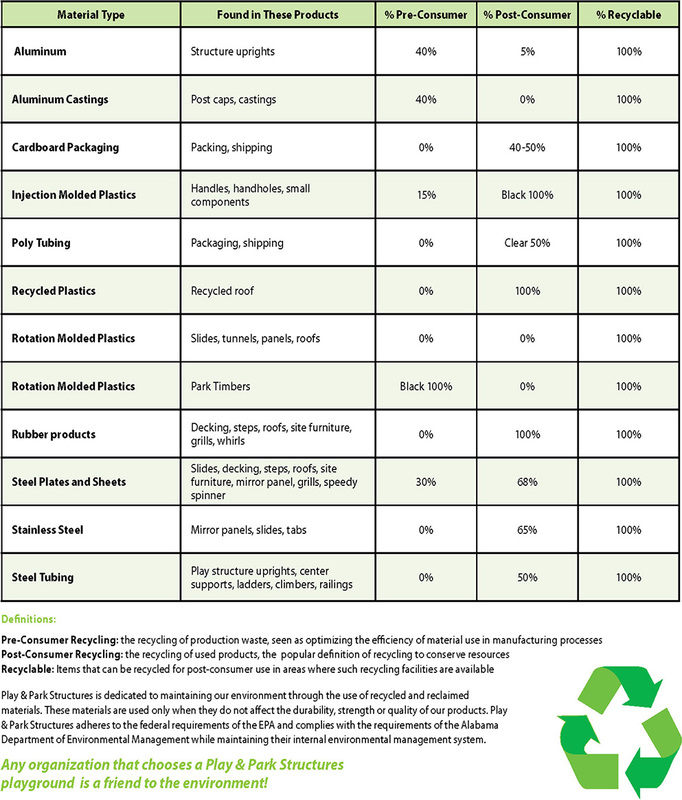 An industry certification process issued by the International Organization for Standardization. It is used to measure manufacturing standards and to certify company compliance with quality control systems covering design, development, production, installation, inspection and testing. We are proud to be ISO14001 certified for our manufacturing facility in Fort Payne, Alabama. Also referred to as the “Green Certification,” ISO14001 is an internationally recognized standard for environmental management, measurement, evaluation and auditing. As an ISO14001 certified company, Play & Park controls the environmental impact of our activities, products, and services by implementing and Environmental Management System (EMS) that meets international standards, but is specific to the play products being produced. ASTM International is an independent and world renowned developer of technical standards utilized in testing a multitude of products. ASTM’s F15.29 committee met regularly for over a decade in the continual development of the F1487 Standard Consumer Safety Performance Specifications for Playground Equipment for Public Use. The original standard, F1487-93 was published in 1993 and subsequently replaced by the current version F1487-11, published November 2011. In the interest of public playground safety, the International Playground Equipment Manufacturer’s Association (IPEMA) provides a Third Party Certification Service whereby a designated independent laboratory, TUV America, Inc., validates an equipment manufacturer’s certification of conformance to ASTM F1487, Standard Consumer Safety Performance Specification for Playground Equipment for Public Use, except sections 7.1.1, 10 & 12.6.1; to CAN/CSA Z614, Children’s Playspaces and Equipment, except clauses 9.8, 10 & 11, or both. Check the IPEMA website, www.ipema.org, to confirm product validation. The Consumer Product Safety Commission is an independent agency within the United States Federal Government with the authority to inform the public of current product safety performance information and recommended practices. The CPSC first published their guidelines for public playgrounds in 1981 and have updated their publication several times since then. The current CPSC Handbook for Public Playground Safety, publication #325, is an excellent guide for owners and operators of public play environments. The Center for Persons with Disabilities (CPD) is Utah’s University Center for Excellence in Developmental Disabilities in Education, Research, and Services and has been a leader in the disability field for over 35 years. Their mission is to “collaborate with partners to strengthen families and individuals across the lifespan through education, policy, research and services.” The Center represents more than 14 disciplines, and the specialized staff conduct both basic and applied research, and operate over 70 programs throughout Utah and across the nation as part of a national network focused on improving life for people with disabilities and their families. The CPD is a proud partner in promoting inclusive playgrounds that thoughtfully consider the needs of the child and how they achieve independence and equality. PlayCore and the CPD have partnered to create a variety of resources about universally designed playgrounds including 7 unique principles of inclusive play that focus on the actual experiences and feelings of a child during play and on the collective playground environmental design. For further information about the CPD visit www.cpd.usu.edu. Click here to learn more about our resources on universal playground design. The Natural Learning Initiative (NLI) is a research and design assistance program of the College of Design of North Carolina State University. NLI creates environments for healthy human development and a healthy biosphere for generations to come. The purpose of the Natural Learning Initiative is to promote the natural environment in the daily experience of all children and families, through environmental design, action research, education, and dissemination of information. Play & Park Structure’s parent company PlayCore is proud to work in partnership with the Natural Learning Initiative to create naturalized playgrounds through the NatureGrounds program. Since 1980, The National Lekotek Center’s “therapeutic play” philosophy has grown to include a network of 20 affiliates, who serve over 6500 families annually. Lekotek offers a vast model of programs including; family play sessions, toy lending libraries, Compuplay programs, and other services, such as home visits, that meet the unique and diverse needs of families. Developed in partnership with the National Lekotek Center, 2Play Together, offers a rich inclusive play program specifically designed to promote inclusive play, understanding, and fun between children with and without disabilities on the playground. As the country’s leading source on play for children with special needs, PlayCore is proud to partner with The National Lekotek Center to carefully evaluate a variety of products through their AblePlay Rating™ system to assess how it meets the needs of children of all abilities and support more inclusive play opportunities. Through Play & Park Structures partnership with Robert-Leslie Publishing we have created the Outdoor Creative Play & Learning System. This is a valuable resource for maximizing the opportunity for creative play and standards-based learning in the great outdoors. Play & Park Structures is the first playground company to offer standards-based activities for outdoor play because we are committed to maximizing the value of your playground and helping children to meet their physical, social and academic goals.